Content marketing and SEO are some of the best ways to generate leads and acquire new customers for your business. In fact, 53% of marketers say blog content creation is their top inbound marketing priority. If you don’t use the most cutting edge SEO copywriting tactics it will be almost impossible to improve your blog’s traffic. In this post, I’m going to show you the most effective SEO content writing tactics which you can actionably implement into your companies blog. Once you have your topic and your keywords are chosen it’s time to start creating awesome content! This is a monster 6,000 word guide, so I broke down the SEO content writing process into 3 steps and I included an interactive table of contents. You should have a pre-writing template ready to be filled out every time you’re about to write a new post. Having a pre-writing template filled out every time you write a new blog post ensures consistency within your content. You can create your own template or you can just make a copy of the template I use. You can make a copy and work with the template I use here. What’s The Purpose of Your Post? You should know the purpose of why you are writing your post. Are you writing your post to answer the questions of your target audience, and provide solutions for their pain points? – Are your writing your post to get backlinks to improve your website’s domain authority? -Are your writing your post with the goal of doing well on social media? What ever the purpose is of why you’re choosing to spend the time writing for your blog post, you should know the reason and implement this reason into your writing. 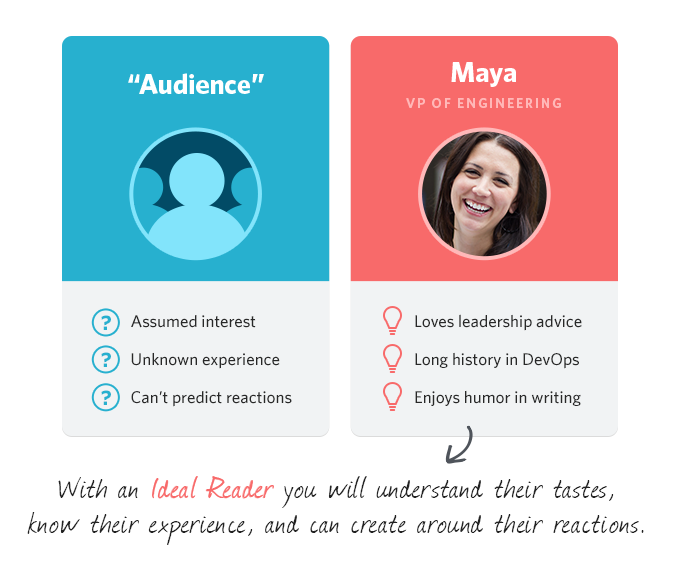 You should know the buyer personas for whom you’re writing. This is your target audience and the audience that will be reading your article. I will go more into detail about buyer personas in a later post, but it’s vital for you to know everything about your target audience if you want your content to succeed. Your content needs to resonate with your buyer personas on an emotional level. You should have already defined the different stages your buyer persona could be in as they take their journey to buy your product or service. Taking a step back, it’s important to create content that resonates with your persona during each stage of the buyer journey. In each buyer journey stage, your buyer will have different questions and will have different pain points. You need to have a solid understanding of the journey your buyers will take before they buy from you. Assuming you already have a firm grasp of this you should state in the template what buyer journey stage your content fits in with. Also, what questions are you trying to answer for your readers? 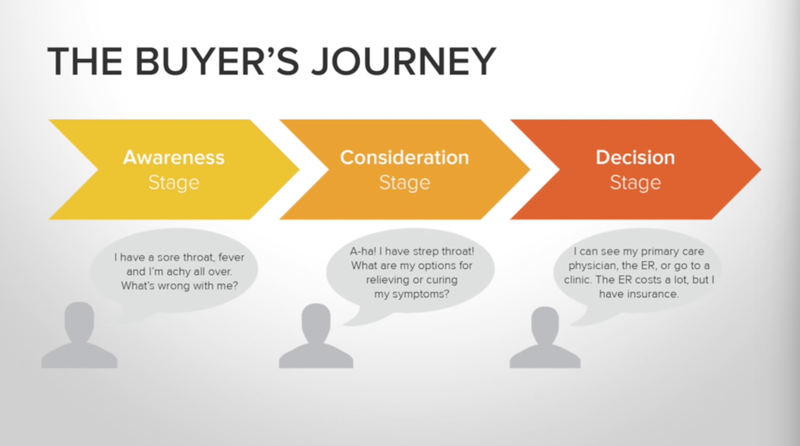 You can further your knowledge about the buyer journey stages with this great guide by Hubspot. Whats the big idea of your post? -Summarize what the big idea of your blog post is in a couple words. As you move through the pre-writing template you will start to get a better understanding of what your post is about but if you want to write an awesome post you’re going to have to do awesome research on your post topic. To make this research strategy as actionable as possible, I’m going to walk you through the research steps I used before I wrote my last post, The 3 Types of Digital Marketing That Will Hack Your Companies Growth. 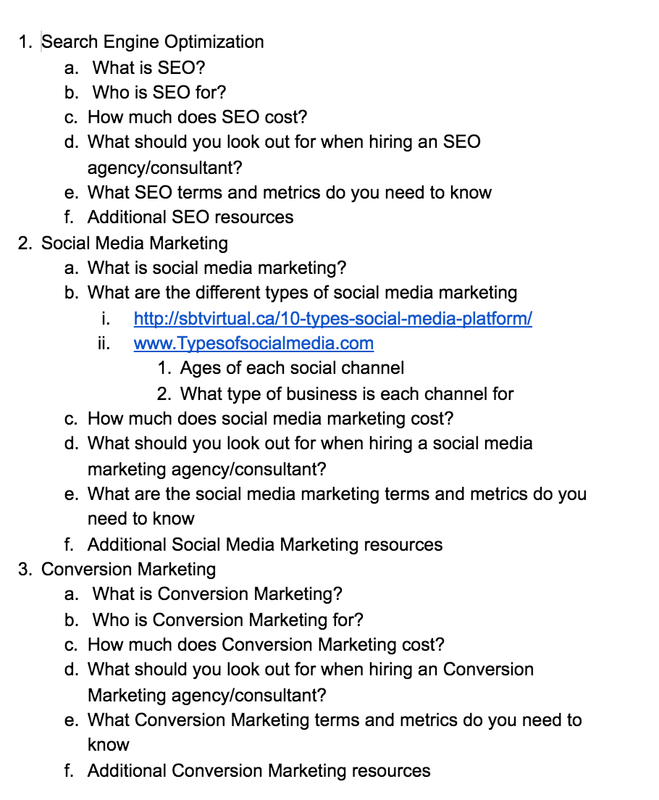 The purpose of the post was to provide my readers with a list of the most effective digital marketing types. Once you have your keywords the first step is simply putting your keywords in Google. Check out what content is already ranking in the Google organic search results. Check out the #1 ranking result and read or skim the content. Take note of how the ideas in the content are structured and make a rough outline of the key insights. You’re pretty much reverse engineering the content that’s already ranking and taking key insights of the content’s idea structure. Is there anything missing with the content that is already ranking? You can think of the content gap as used in Brian Dean’s Sky Scraper Strategy. 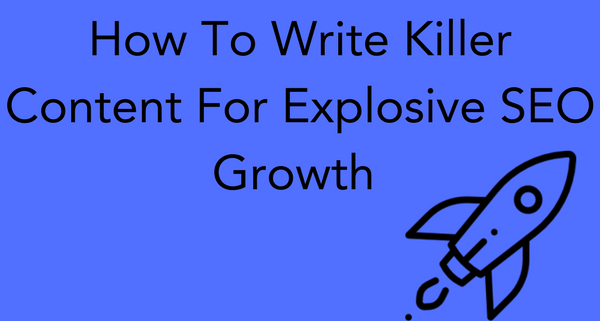 His strategy involves initially targeting content that can be improved but with this Pre-Writing Template, you just target the absolute best content that is ranking #1 for the keywords you want to rank for. Then reverse engineer an outline and find areas in their content that are missing. You want to add unique ideas to the pre-existing content outline structure. If you think about it, you are taking what’s already the best content in the eyes of Google and making it even better. This pretty much completes your outline but you should try to find missing holes in more URL’S than just the first result. Try the 2nd and 3rd results for the keyword you’re targeting. Add to your outline. Use a number system and assign all of the main ideas a number. These will be your sub headings. Then get ideas that follow under the main idea and start to improve your outline. Again, Hubspot has another great article on creating a perfect outline. Start your outline based on what already is the greatest content in the eyes of Google, but don’t stop here. Improve your outline until it is filled with unique and valuable insights that you can incorporate into your writing which will ultimately make your content better than the absolute best (I say it again) in the eyes of Google. As soon as you have your outline set you should write your headline. This is what your post is all about in around 6 words. You need to spend some time creating an awesome headline because it will improve your posts Click Through Rate (CTR) in Google’s search results, social media traffic CTR, and just generally improve the post’s chances of being viewed. The first thing you should do when it comes to creating your headline is make the headline data driven. Basically being data driven means to use facts that have been proved by surveys, testing, or any type of experiment and make conclusions from these proven facts. So, in terms of writing a headline you should add proven facts (data) into your headlines. 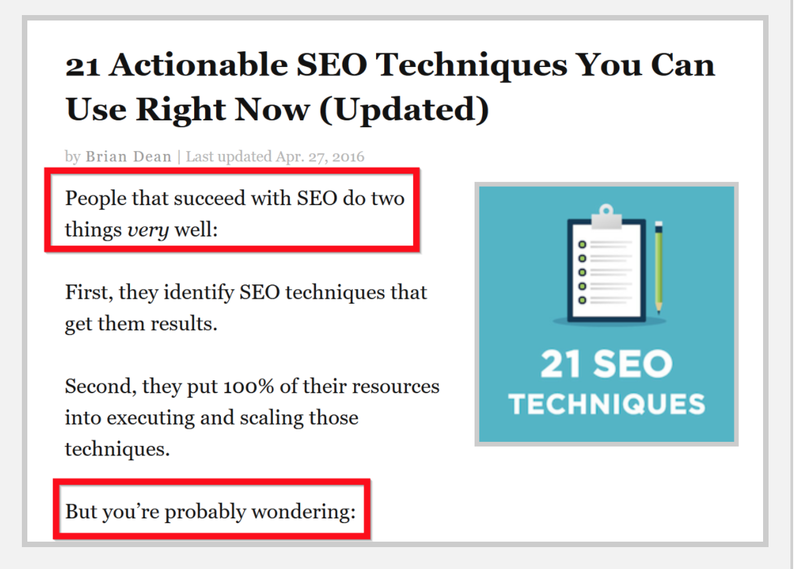 In Brian Dean’s awesome blog post on SEO Copywriting, you can see the impressive data he added into his headline which resulted in his post getting almost 1,000 social shares. If I haven’t done any of my own experiments how can I find data? 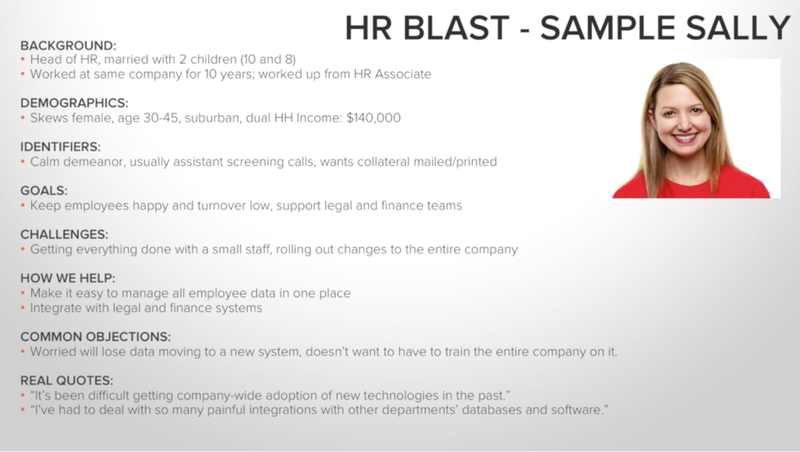 Well, I recommend using a tool like Survey Monkey to create surveys which you can email to your connections as well as cold email to people outside your circle. The survey should collect data which you can use to prove a fact. If you don’t have the time to run your own survey you could always just look at the quick links below for places to find actionable data. Don’t just make your headlines data driven. You should incorporate valuable data that proves your points throughout your entire post. When you are writing your post opinions you have are ok to make every now and then but you should primarily focus on making statements that are backed up and proven by reliable data. If you include data you will have a good headline. If you include data and a benefit for using the data you have a great headline. The benefit for the visitor will be proved by data which will earn the visitors trust, and the benefit in itself will make the headline purposeful. 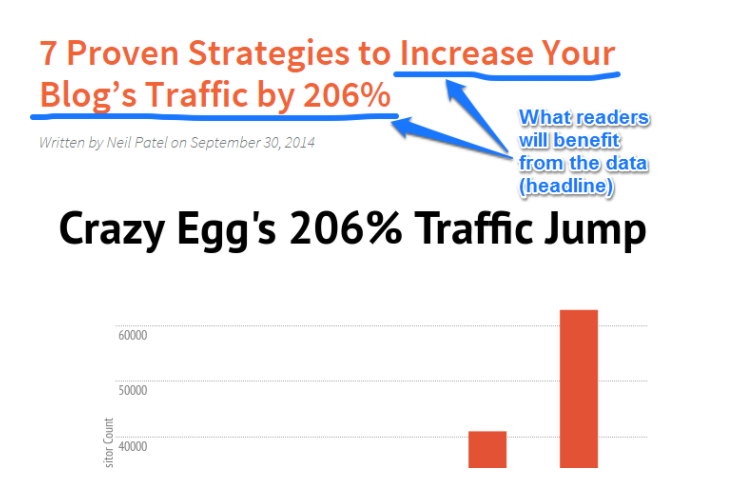 When you have a headline filled with purpose your CTR will drastically increase. In addition to combining data and benefits together in your headlines, you should also think about trying to add some emotion. 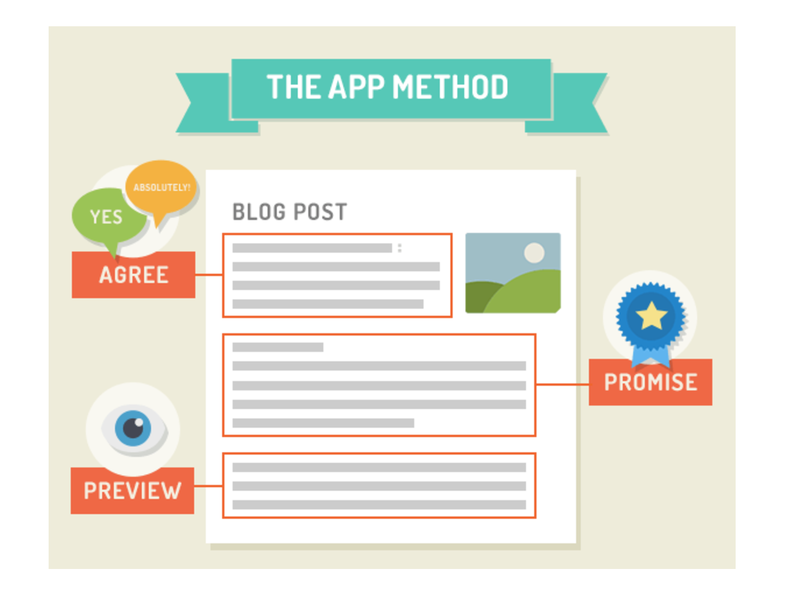 The Next Web has a great post that talks about The Anatomy of The Perfect Blog Post. 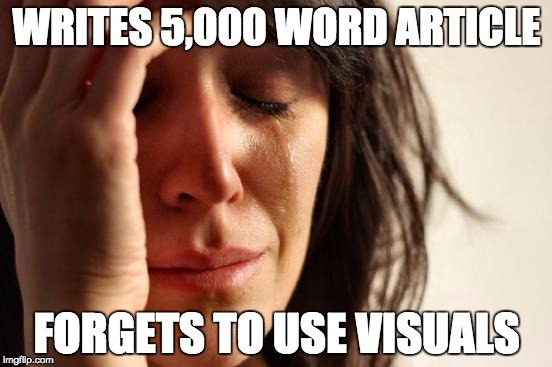 They include templates for creating headlines with emotion. The last finishing touch you should sprinkle into your headline writing is adding something that will help the post go viral. You want to use bits and pieces of headlines that have already gone viral. 1. Use Buzz Feed and Viral Nova to borrow “viral keywords” to incorporate into your headline. 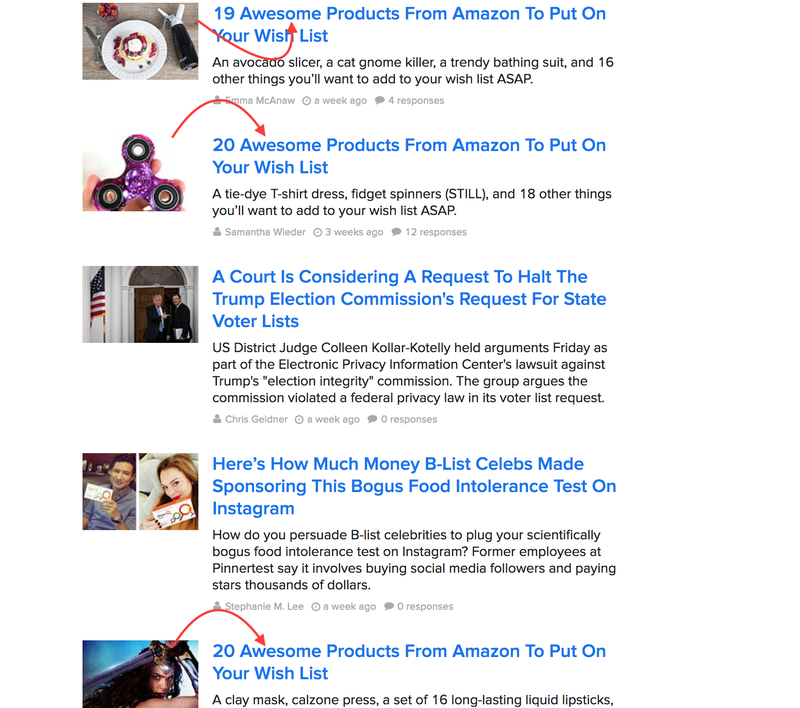 If you’re writing an article about the 10 best marketing tools to acquire new customers for your start up you could go to BuzzFeed and browse around at the different headlines. I knew my post was going to be a curated list of the 10 best startup marketing tools so I searched “list” in the search bar of BuzzFeed. As I was going through the results on BuzzFeed for the keyword I searched “list” I started to see the keyword “awesome” show up a lot. By simply using the search feature on BuzzFeed I came up with an awesome 🙂 headline just waiting to go viral. You should check the headlines of the content that is already ranking in the top positions of Google for your target keyword. You can get some insights on what the headline structure is and maybe even use it in your headline. 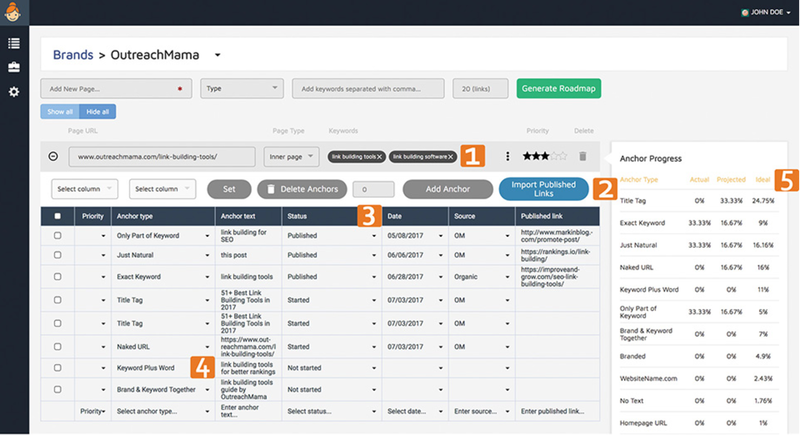 You can use this awesome tool called Buzz Sumo to see what content has the most social shares relating to a certain topic or keyword. 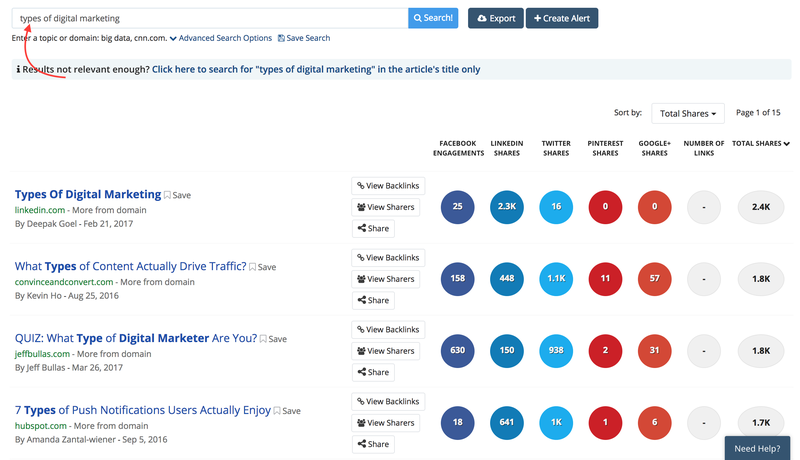 Start by just simply putting your keyword or topic into the BuzzSumo search. 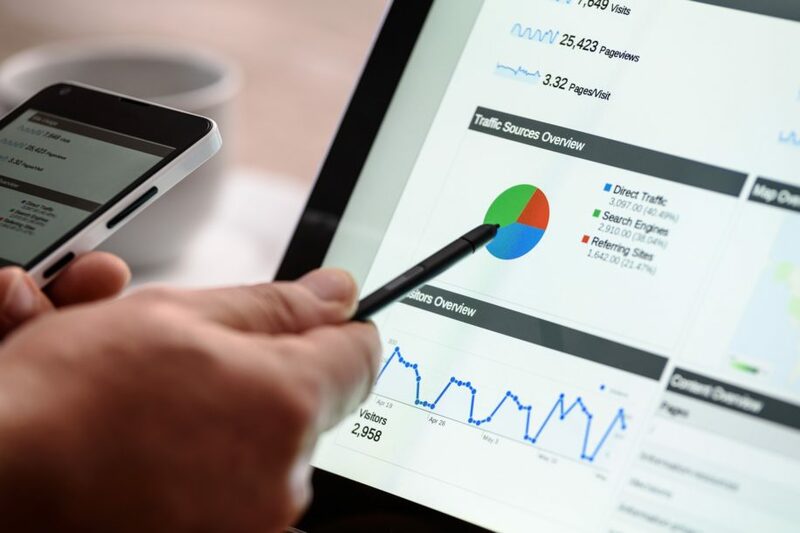 Before you start actually writing you should be thinking about the best SEO practices you need to follow if you want your content to get ranked by search engines. Like I have mentioned you should already have done your keyword research prior to reading this post. If you haven’t done your keyword research here is another really awesome guide on keyword research. I will go back to my “types of digital marketing” post once again. Once you have 1 or 2 keywords you want to rank for you should come up with a list of around 5 more LSI keywords. Now, what the hell is an LSI keyword? LSI stands for Latent Semantic Indexing, and LSI keywords are simply words or phrases that relate to each other. The keywords don’t necessarily have to be synonyms, but they have to have some sort of topical relevance. To reiterate my point the LSI keywords you come up with need to have topical relevance, and not just sound the same because the same word can relate to 5 completely different topics as seen in this great example from The Content Wrangler. And another great example from Beginners Book. Put your original Keyword in Google (mine was on page SEO), and scroll down to the bottom of the Google Results where it says “searches related to” your keyword. 2. You can also use this awesome LSI keyword generator tool. You shouldn’t spend too much time on LSI keywords but using the 2 quick methods above you can easily generate a list of 5 LSI keywords in under 5 minutes. 3. If you’re not sure how to mix up your exact match and LSI anchor texts, use a tool like Linkio to develop an anchor text roadmap. First, think of how you benefit from your normal keywords? 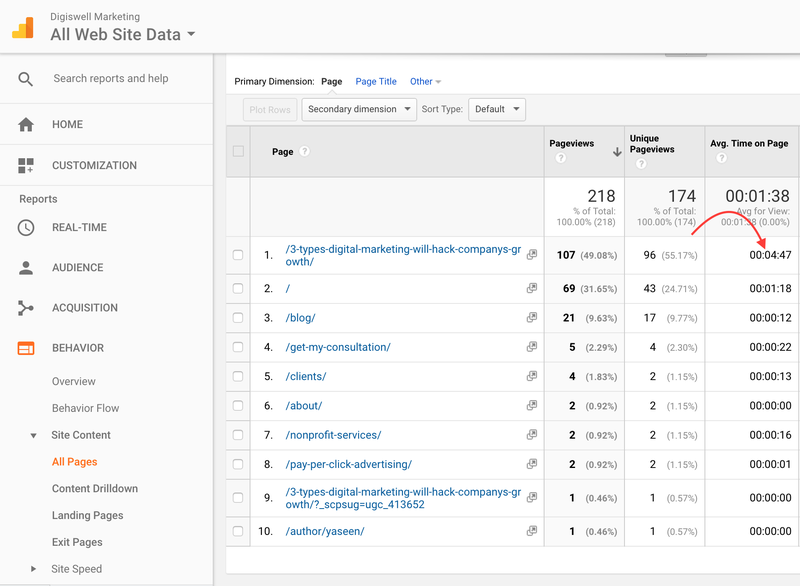 When your content ranks for a keyword you’re targeting you get traffic from visitors searching for your keywords. When your content is also ranking for many other keywords that are topically related to your original keyword it’s just a simple way to get more traffic from a multitude of keywords. It’s a no brainer once you get in the habit of using LSI keywords! As you go through the SEO section of this post you should have a list of your original keywords and your LSI keywords open. You should add your LSI keywords in many of the same places you add your normal keywords in. As awesome as LSI keywords are, you should never forget your primary keywords. You should focus on adding your primary keywords because without them your LSI keywords are meaningless. 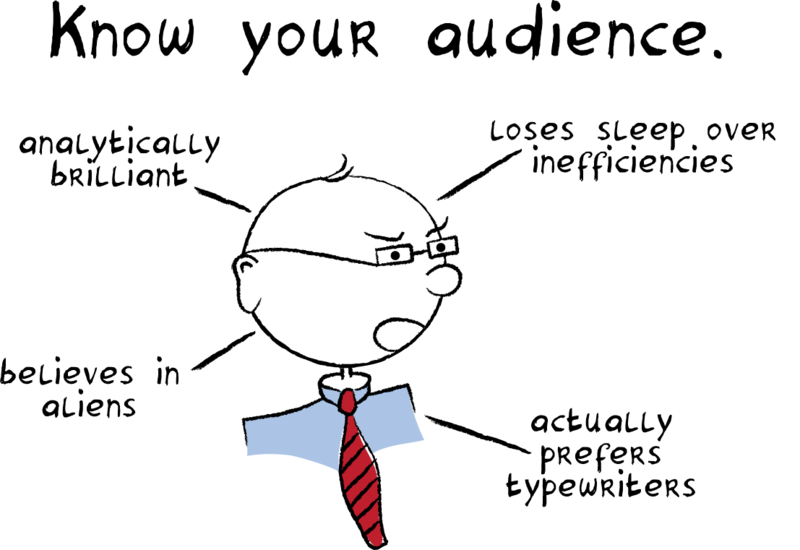 You need to get a plugin for WordPress called Yoast SEO. This will help you do SEO much faster. First, you want to scroll down to the bottom of the post and go into the Yoast SEO snippet editor. You want to paste your headline into the SEO title snippet editor. Make sure the keyword you want to rank for is in your title. 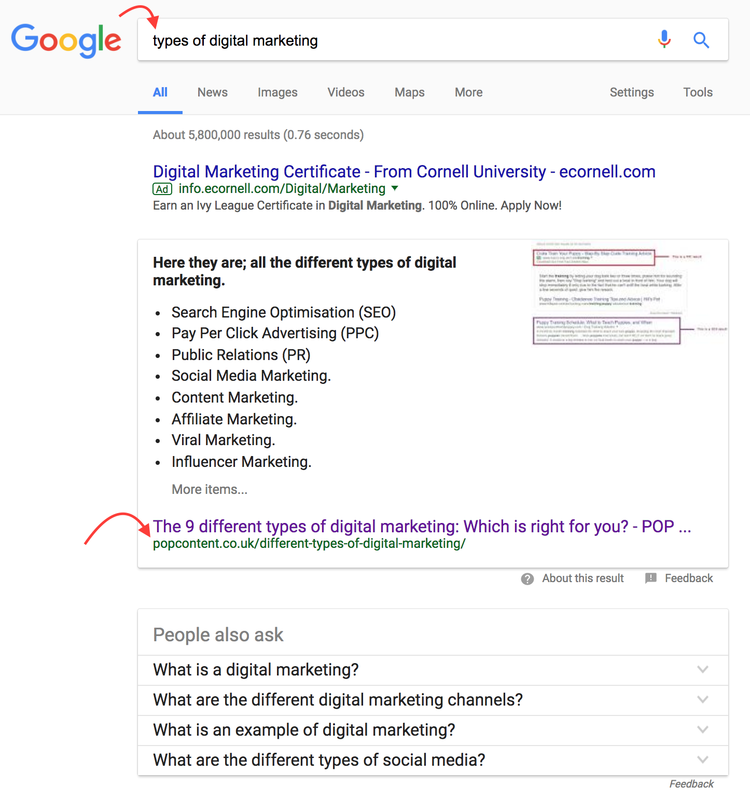 For some reason Google puts more emphasis on keywords that appear closer to the beginning of your title tag, so try your best to put your keyword as close to the beginning of the title tag as possible. 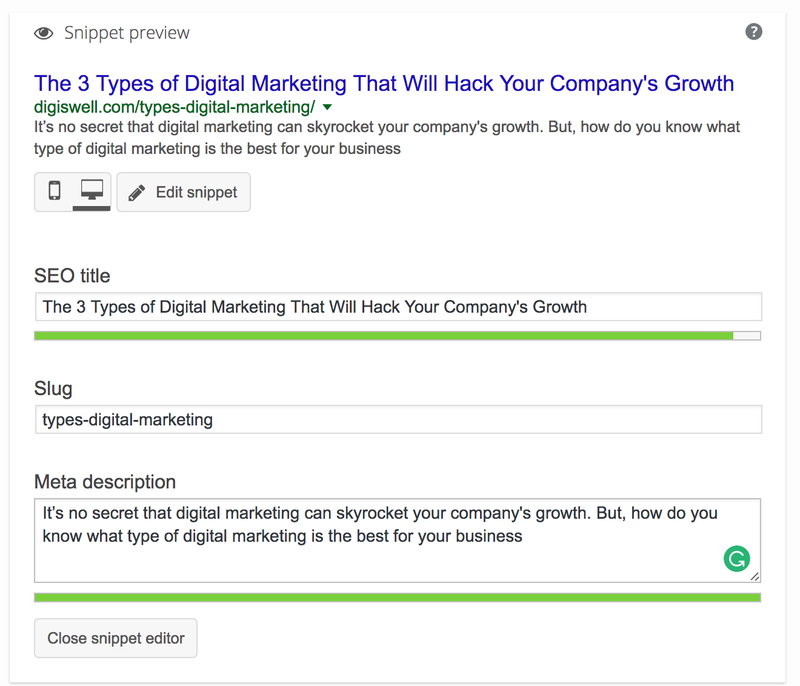 You want your title tag to be between 50-60 characters long, The Yoast SEO plugin makes it easy by showing a green line when your title tag is the right length. You also want to make every word of the title tag have a capital letter. Often times your title tag can be identical to your headline but always make sure your title tag meets the requirements of Google and other search engines. Some quick tips to optimize your URL is to make sure your keyword is in the URL and make your URL is short as possible. You would be surprised to know that the meta description doesn’t carry any SEO value, and it will not affect your rankings, but that doesn’t mean you shouldn’t care about your meta description. You can think of the meta description like the title as sort of like an ad copy that attracts readers to your website. Make sure your meta description is under 160 characters. Again the Yoast SEO plugin will display a green line when your meta description is the right length. Include your keywords that you’re targeting into your meta description and Google will bold them. 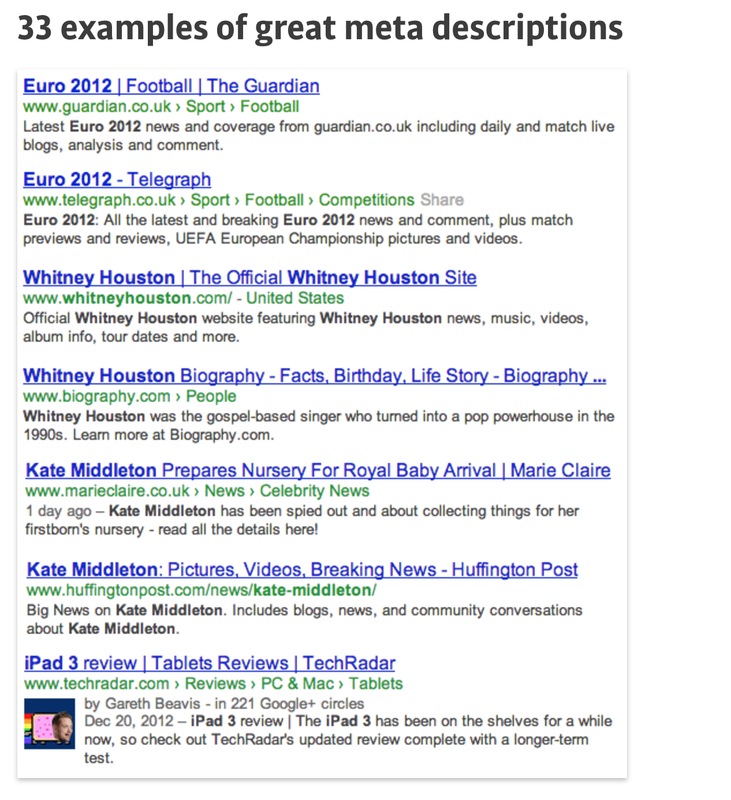 Here are some examples of awesome meta descriptions, and as you can see Google has bolded the keywords. It can sometimes be hard to think of an original meta description, so I usually just copy some lines that I used in the intro of my post and just paste it in the meta description snippet editor. But you need to make sure you have incorporated your keywords. When you see an opportunity should add a Call To Action (CTA) into your meta description. Inviting your potential visitor to partake in a certain action. You simply add the keyword that you want to rank for in the focus keyword section and Yoast SEO will do the rest. You should add your primary keyword within the first 100 words of the content. In addition to just the beginning of your post, you should add your primary keywords 2 to 4 times throughout your entire post. Don’t overuse your primary keywords more than 4 times each because it can become obnoxious to your readers and you will actually be penalized by Google. To keep track of how many times you are using your keyword in your post you can use the Keyword Density feature that’s also part of the Yoast plugin. Here you will see your keyword density or how many times your keyword appears. You should aim for a keyword density between 0.5% and 2.5%. 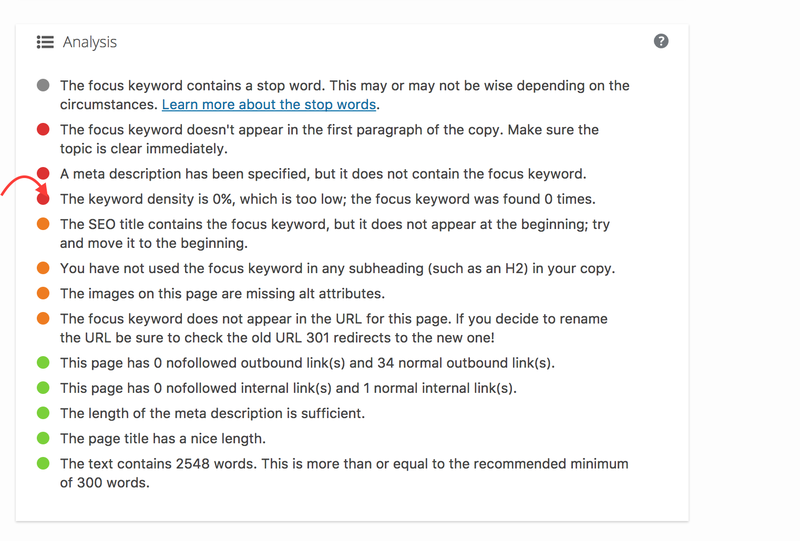 This feature is really helpful but if you want to see the density of more than 1 keyword you need to purchase the Yoast SEO premium plan. Quick Note: You shouldn’t be forceful when adding your keywords into your content, it should look and feel organic to the reader. To avoid overusing your primary keyword you should use LSI keywords throughout the content of your post as well. You should aim to add at least 3 LSI keywords throughout the entire post, but only use each LSI keyword a maximum of 2 times. You can do this easily by clicking the “Paragraph” drop-down under the “Add Media” button. Simply highlight the text in your WordPress doc that you want to be your heading or subheading, and choose how big you want the heading. Another area of your content that is considered “high visibility” is the ALT image tag of all of your images. The Alt image tag is a few lines of text that are used by the Google bot to understand what an image is without actually seeing the image. This is also a great opportunity to add primary and LSI keywords. You should add an ALT image tag for each and every image in your post. Here you can easily add your keyword that you want to rank for into the Alternative Text field. Before I get into the 2 different kinds of links you should have in your content you should understand the purpose of a link. For the most part, the purpose of a link is to help the reader further explore a certain topic. That being said links can have tremendous SEO value as well. Internal links are links pointing from your website to another location on your website. The destination of an internal link is just another place on your website. External Links are links pointing from your website to another website on the internet. Look out for opportunities when you are writing to add internal or external links in places that will help the reader further understand something you may not cover in your post. First off I learned this tactic from one of the best marketers I know, Robbie Richards. At the end of your article, or just at the end of a specific section in your article, you can add an “Additional Resources” or “Recommended Reading” section that includes internal or external links to help the reader further understand a topic. When it comes time to promote your blog post, you can reach out to the people or influencers you have mentioned in your “Additional Resources” links and promote your post. 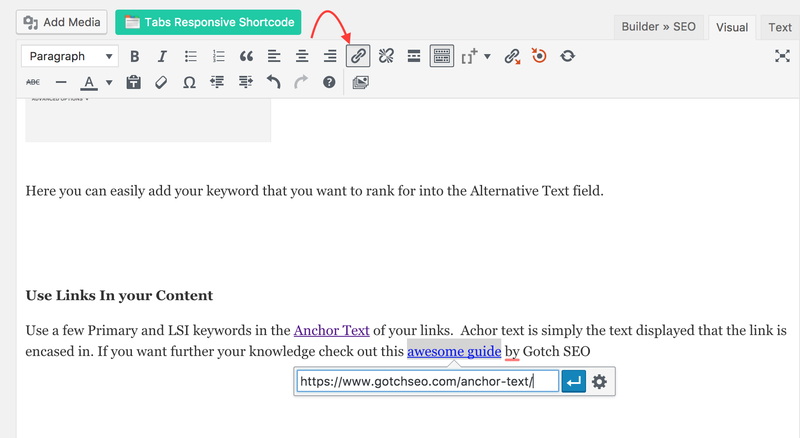 Use a few Primary and LSI keywords in the Anchor Text of your links. Achor text is simply the text displayed that the link is encased in. Again, don’t force your keywords into your anchor text, you should make it look organic. You need to make your anchor text as relevant to the content of the link. Most of the time your keywords will be relevant enough to be placed in the anchor text because the whole point of linking is to provide relevant content to your content that will provide more information to the reader. When you want to add a link just highlight the text you want to have as your anchor text and press the link icon in WordPress. At first, I know how optimizing your post for Google can seem like a daunting task. You might even want to skip some of the smaller Optimization Techniques to save time. That being said, I can guarantee that if you get into the habit of going through each and every SEO technique on the list when writing your post you will be rewarded with a massive increase in traffic. Once, you have your prewriting template filled out and writing for SEO is in your mind you should find a place free of all distractions and just start writing. When you spend lots of time researching, optimizing, and putting together a piece of content the last thing you want is for a visitor to read your intro and then leave your site before reading any more of the post. You should follow an intro writing template every time you start writing a new post. This is an intro template you should follow that I learned from, once again, Brian Dean. It’s a 3 step process called the APP method. You want to start off with something that everyone reading your post will agree with, You can get the best results by adding a known pain point that resonates with your readers that they can also all agree with. But you need to make sure it’s relevant to your content. 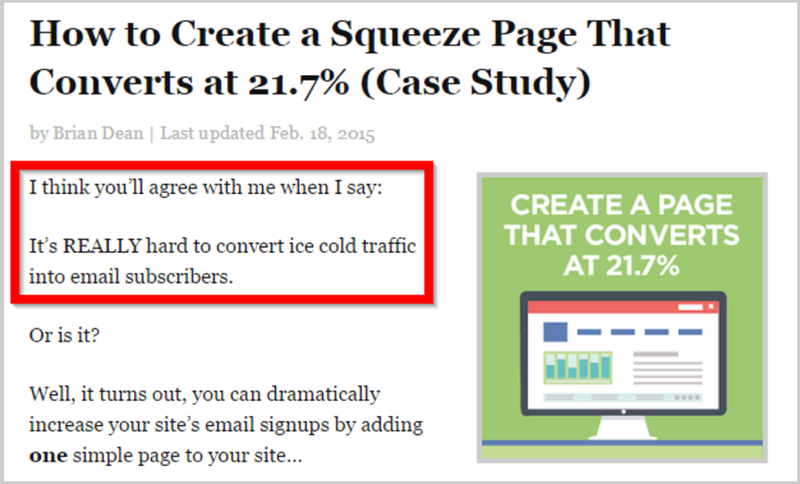 As you can see Brian Dean added a pain point about converting cold traffic into email subscribers. So, after you have your reader agreeing with you, you’re going to promise them something. You’re not directly going to say “I promise” but you are going to make a promise by showing them that there is a solution to the pain point that they just agreed with. You are essentially showing them what could be. It also helps to add data and social proof into your promise as well. This will make the solution to the pain point your reader agreed with more actionable and the promise will resonate with your readers more. If you have successfully followed the previous steps in your intro, your readers will already know that there is a solution to a pain point that they agree with. But now in your preview, you will talk about how to actionably solve the pain point they originally agreed with. If the agree, and promise section of your intro relates to your content, which it needs to, then your preview will just simply talk about what they are going to read in your post. You should be direct when you are stating your preview, just simply tell them what they are going to learn in your post. After you hit them with the 3 sections of your intro your readers are going to be hooked! If you optimize your content’s structure properly you will impress Google and that will help you increase your rankings. You can improve the average time your visitors spend reading your content by optimizing the structure of your content in 5 simple steps. When you increase your average time on page metric, you actually will boost your rankings in Google. 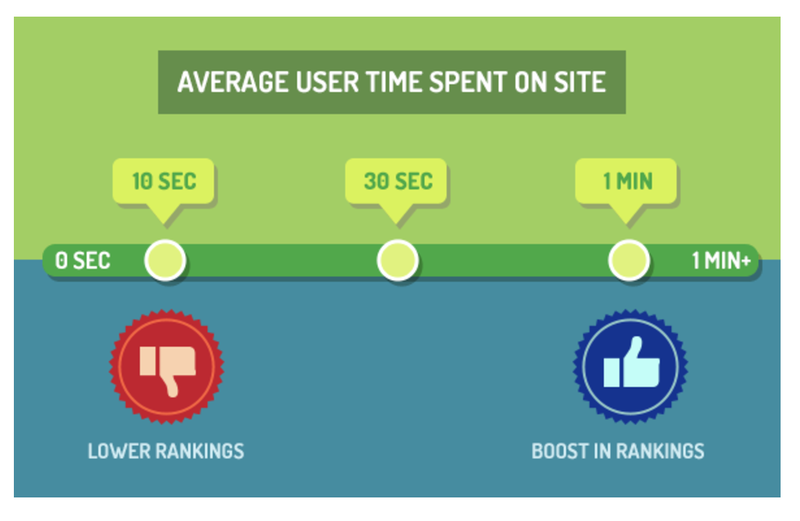 A rule of thumb is to have an average time on site of at least 1 minute. 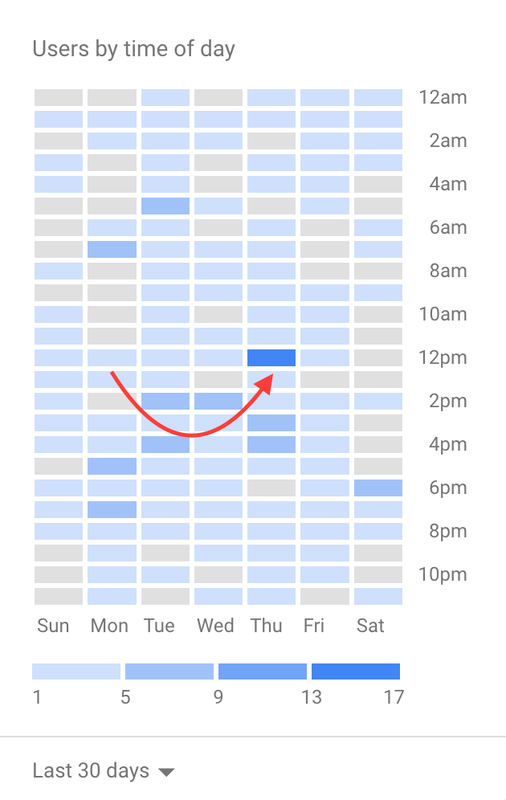 First, go to your Google analytics dashboard and click on “Behavior” in the side bar. Then, click the “Site Content” drop down in the Behavior tab. Finally, click “All Pages” and you will be able to see the average time on page for all of your content. As you can see in the screen shot my average time on page for my latest post is up to almost 5 minutes which is awesome. 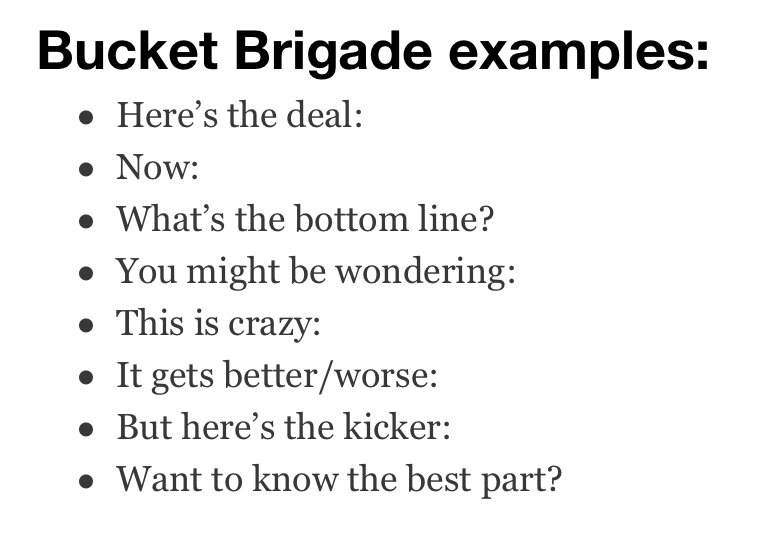 Bucket Brigades are words or phrases that encourage readers to move to the next line of content when reading. When the visitor sees a bucket brigade they will feel persuaded to continue their read and hence not leave your blog post. 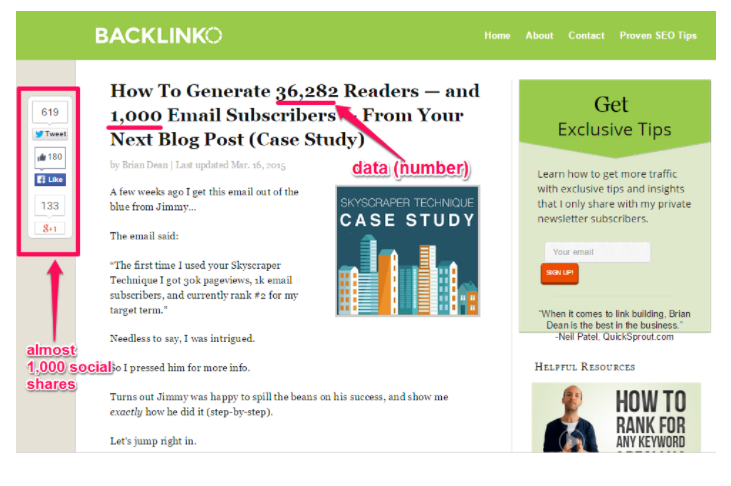 Bucket Brigades will also help readers scan your content. When you write posts that are scannable you boost your content readability by 57%. 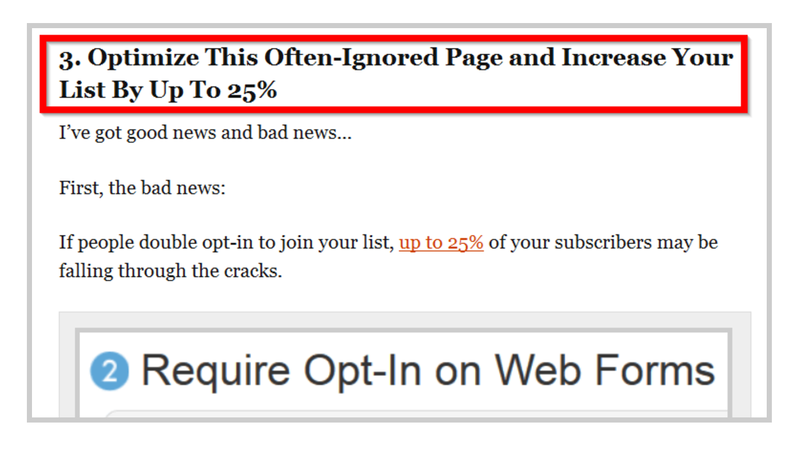 You should find places in your content where people could potentially stop reading and leave your site. A good place to start is your intro, but there will definitely be areas in your main body of content that bucket brigades would be needed as well. When you make the copy of your headings unique and interesting to read you are helping the reader stay engaged with your content. 1. Use Buzz Feed and Viral Nova to borrow “viral keywords” to incorporate into your headings and subheadings. 3. Include a benefit in at least 25% of the subheadings in your post. 4. Make your headings as unique as possible, but don’t forget to optimize your headings for your keywords. This is very simple, but don’t cram all of your content together with no spaces. Work on writing short idea blocks of a content that are 3 to 4 sentences long. 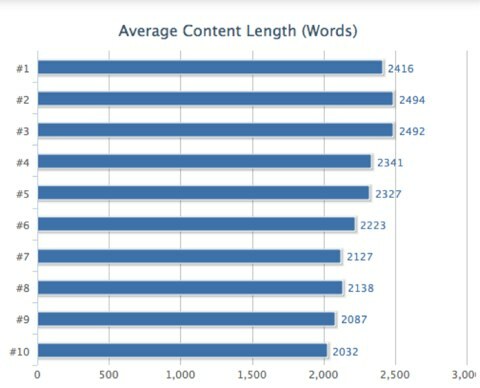 This is obvious, but if your content is longer in word length your readers will spend more time reading your content, which will increase your average time on page metric. As you can see the average word count for an article ranking #1 in Google is 2,416 words. I would make it a goal to write around 1,250 words an article as a minimum. Another benefit of writing a lot of words is that longer form content is 52% more likely to be heavily shared. Pogo Sticking refers to the action of when a visitor clicks on your site in the Google search results and then immediately leaves your content to go back to the organic results. In other words a visitor clicks on your site, doesn’t like what they see, and then leaves to go back to Google to find a better result. If you want to reduce pogo sticking you need to get people to read the first few sentences of your post. In order to make people read the first few sentences, you need to have fewer characters in your first few sentences. When you write with fewer characters per line your content readability gets boosted 58%. Simply make the font for the first couple of lines larger. 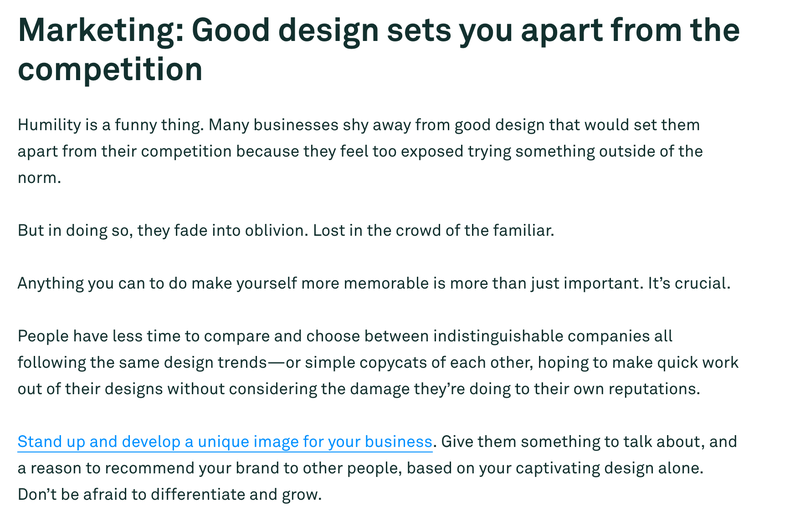 You can see in this blog post that the first few sentences are significantly bigger than the normal font size of the content. 2. You can add an image next to the first few lines to reduce your line length. As you can see in this example, there is a custom graphic near the start of the post which also reduces the line length of the first couple of lines. If you want to learn more about content width here’s a great guide. Different forms of visual media are essential if you want to create awesome content. Did you know that if you use just one image your content credibility will be boosted by 75%? 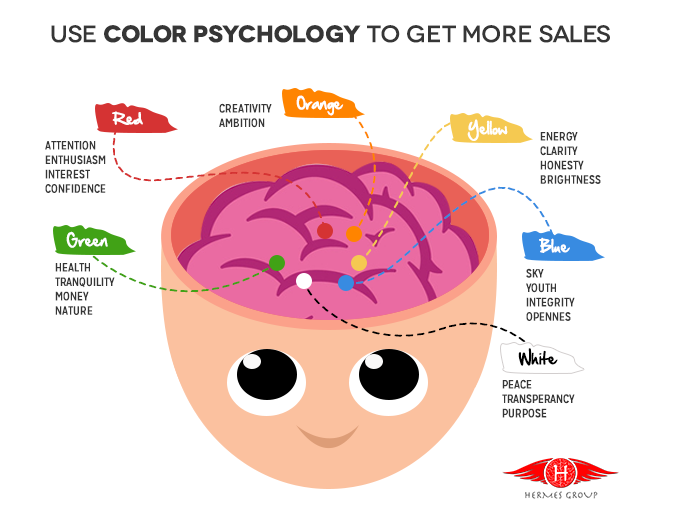 A quick tip with visual imagery is to use certain colors in your media to provoke certain emotions in your readers. If you want to make your content great you need to take on a writing style of your own. I’m going to show you some writing styles you can adopt to make your content good, but you need to start writing and experimenting on your own if you want your content to be GREAT. You need to focus on making your writing conversational with your readers. Expert Marketer, Neil Patel, recommends using the words “you” and “I” to make your content have more of a conversational feel to it. Also, to make your content more conversational, when you are in the process of writing you should think about one person that you’re writing to. Think about this person as your ideal reader. It’s hard to have a conversation when you’re thinking about an entire audience of people, so just focus on one individual and get in the habit about thinking about writing to them everytime you’re about to create a new post. Did you know that when Warren Buffet writes he always thinks about writing to his sister? You should embed the action of taking action into the foundation of your writing style. When you create content that is actionable you give your readers a feeling of practicality. When you create content that’s practical your article is 34% more likely to go viral. One quick tip to be more actionable is to include visual screen shots with arrows pointing to certain places in your screenshots that could further help the reader understand your content. You can also check out this helpful article on how to add arrows to your screenshots. You should always spend time revising your content after you have written it. I would recommend waiting a couple of hours from when you finish writing to when you edit, so you have a fresh set of eyes. In order to be successful when revising your content, you need to cut out at least 5% of your content. To get the best results when revising you should install a tool called Grammarly and add it to your Google Chrome extensions. 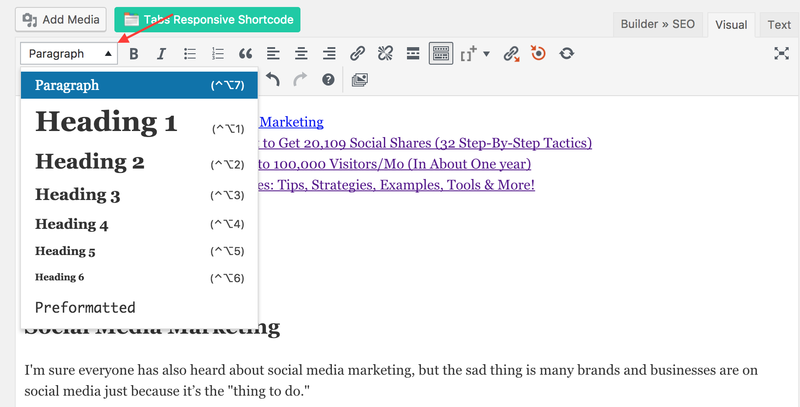 When you install Grammarly you can edit and revise your post right inside WordPress. As you went through this guide you learned the absolute best SEO content writing strategies to increase your Google rankings and to ultimately skyrocket your traffic. I have given you everything you need to start, so the next step is to take action! 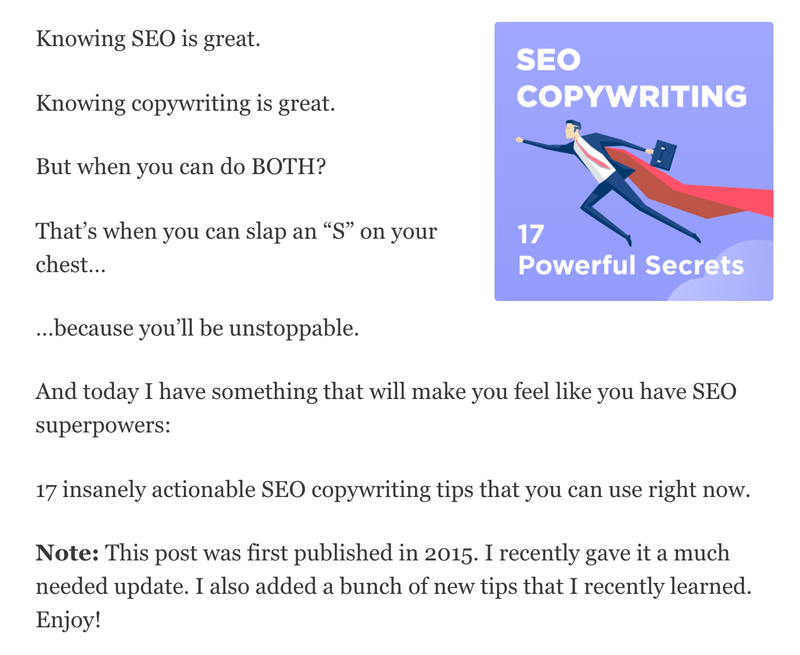 If you still feel like you need to further your SEO copywriting knowledge here are some more helpful resources. I simply want to say I’m new to blogging and site-building and absolutely enjoyed your website. More than likely I’m planning to bookmark your blog . You absolutely have terrific articles. Thank you for revealing your website page. Outstanding post, with a wealth of helpful information. I admired your liberal use of visuals to break up the text, and keep the reader engaged. You took your own excellent advice there. Under “Custom Graphics,” I would have also suggested commissioning work from Mark Armstrong Illustration, but I’ll admit to some slight bias there. Really well done, Leo, thank you for sharing so much info and good advice.